I offer my respectful obeisances to His Divine Grace A.C. Bhaktivedanta Swami Prabhupada, so dear to Krsna on this earth, having taken shelter at the Lord’s lotus feet. He is always engaged in worship of the Lord, he feels he is the lowest and most fallen of us all, he is not desirous of being worshiped. Therefore he is worshipable by me. He only accepts his position because his spiritual master has ordered him to do so. One should never take on disciples unless ordered to do so by the spiritual master. I have committed the greatest offense by taking disciples without the direct order of the bona fide spiritual master. Yet Prabhupada is so merciful that he has even forgiven me. 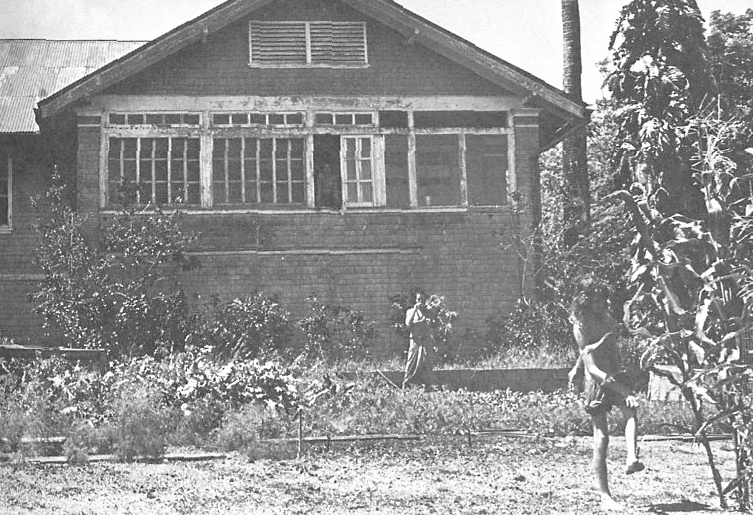 Disciples not abandoned-but saved. Placed securely at the feet of His Divine Grace and the disciplic succession. Set our clocks to the eternal time scale, where example counts more than words; there a million disciples are but a drop in the ocean. My message, spoken by my words and action, is specifically for those who (1) desire spiritual realization or (2) have achieved spiritual realization. In this age of confusion, souls seeking spiritual realization don’t know which path really leads to God, and the spiritually advanced don’t know how best to serve God. So everyone mentally speculates. The searchers for God go from one spiritual path to another, from one so-called spiritual master and theory to the next. The advanced soul spends his time speculating how he can help others. Those who rely on mental speculation are bound to be misled and to mislead others because the mind is material; and that which is material is imperfect—subject to making mistakes. 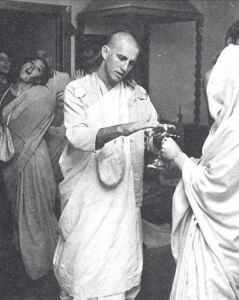 I’ve surrendered to Srila Prabhupada because he, being in the disciplic succession from Krsna Himself, is the way out of this maze of speculation. He is the bona fide representative of the Lord, and he is therefore infused with absolute knowledge and potency. He can easily take one to God; and for those who are beyond the illusion that happiness lies in the material world, he shows exactly what actions they should engage in. No longer are independent, mentally concocted attempts at “turning on others” necessary. As the Kali age gets thicker and more confused, so will the phone book’s yellow pages under Meditation Centers, Spiritual Master, etc. Up to this time, I’ve been a so-called spiritual master, thus adding to the confusion, making it harder for everyone to know which path is actually absolute. To be a spiritual master, one must be in the line of disciplic succession to Krsna Himself and must be an acarya, a perfect example. 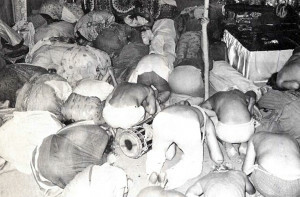 As an example to others, Lord Caitanya, who was God Himself, humbly submitted Himself at the feet of Isvara Puri, the contemporary spiritual master in disciplic succession. Yet I am such an arrogant fool that I, who am nothing more than a lowly maggot, believed that I did not need a spiritual master in disciplic succession. 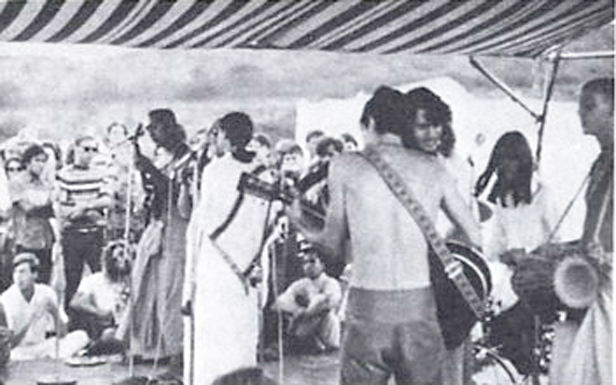 The first time I received the association of Srila Prabhupada’s devotees was at the very much celebrated Sunshine Music Festival held in Diamond Head crater, New Year’s Day, 1969. 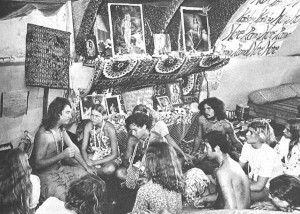 I had flown over from our meditation center on Maui to help conduct the Festival’s religious function and meditation classes. Being inquisitive about them and their “Hare Krsna” chanting, I wandered over to their booth. The devotees were very kind to me. I sat and chanted with them for a while, and one of them showed me how to play the kartals (finger cymbals), although to this day I still haven’t succeeded in learning to play them correctly. I also glanced through a Back to Godhead Magazine for the first time. Thus the seed of the perfect tree was planted. But because I knew nothing of the sweet fruit of that tree of devotional service, I took no effort to water it nicely. Besides, I was too busy trying to turn people on to the Lord’s clear light energy and His all-pervasive feature. One should understand my position at that time. There was no desire for “spiritual realization.” I had some realization of the impersonal feature of God, and because the bliss derived from this was so much greater than any bliss possible in material life, I was moved to turn others on to it. I had no idea of God in His original personal feature. Much of my time and energy was spent trying to find or learn the easiest and quickest means of spiritual realization of God. Having sensed the spiritual power of the Hare Krsna mantra, I became interested in using it as a tool for impersonal realization. So I incorporated the chanting into our Maui asrama program. The invisible potency of the maha-mantra soon began to have visible effects. 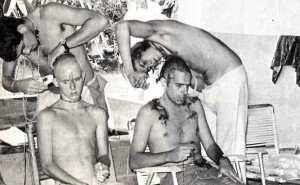 Beautiful forms of Krsna supplanted pictures of impersonalist gurus and mystics. Bhagavad-gita had been our main textbook for a long time, but we had been using an edition by an impersonalist who, like myself, used the maha-mantra to gain the experience of merging with God. Now we began to use Srila Prabhupada’s Bhagavad-gita As It Is, which has a much more devotional attitude. Yoga exercises, breathing, and silent meditation occupied a less and less important part of our program. The sweet nectar of devotional service I had begun to taste by the causeless mercy of His Divine Grace. Impersonalist experiences now seemed dry and void—with as little significance as children’s toys. Chanting the holy name for moksa ended. A bigger fool could not exist than I, for I had been thinking of using Krsna to gain moksa. Only a fool would exchange a diamond for a one-dollar bill. Although I was beginning to relish the sweetness of the name, I had no appreciation for Srila Prabhupada. Out of his mercy he handed me the gem of love for God, and in return I gave him only trouble and more trouble. Yet he has forgiven me. He has no merchant in his heart. Since I already held the post of spiritual master, I retained it, but now I was teaching primarily devotional service—though obviously not pure devotional service. 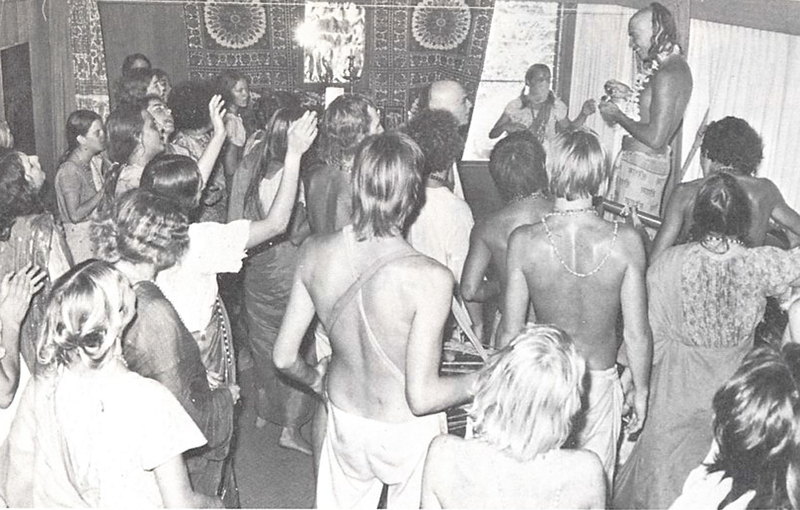 I had no thoughts at this time of surrendering to Srila Prabhupada. I was simply taking from his teaching what I wanted and applying it. The more I engaged in what Srila Prabhupada said to engage in, the more I realized, within, the absoluteness of his words. The stronger my internal relationship with Krsna became, to that same degree the Lord let me know of the absoluteness of His representative, Srila Prabhupada. The more I began to act on this realization, the larger our group got. 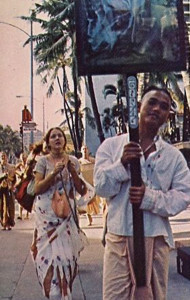 Thus the public in Hawaii got the unfortunate impression that I was the spiritual master of the Hare Krsna movement. 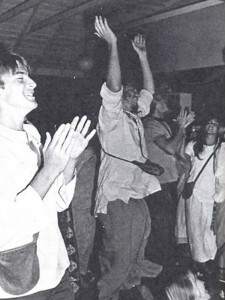 This disturbed many members of ISKCON because I wasn’t really the bona fide representative of Krsna. Yet still they were tolerant towards me. 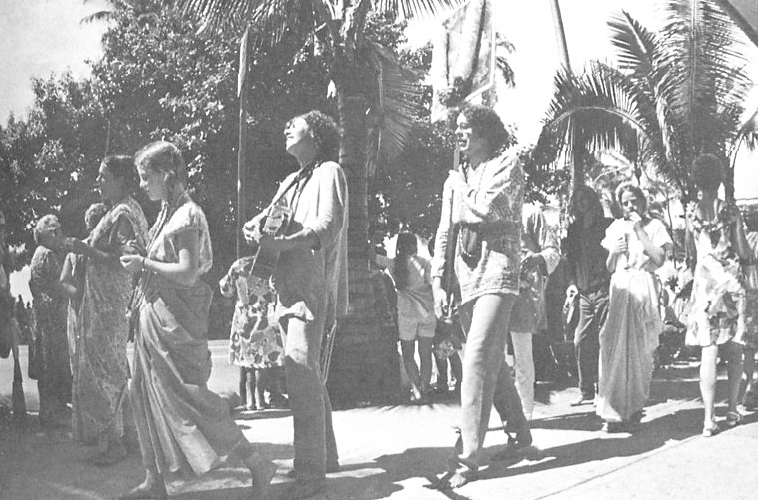 Along with mercifully chastising me for my “independent nonsense,” they helped the community to become Krsna conscious by supplying us with books, musical instruments, mantras, instruction, etc. 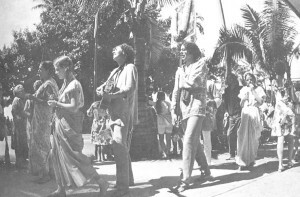 Approximately seven months before my surrender to Srila Prabhupada, it became clear to me that such surrendering would take place. These seven months were a time of realizing more deeply the necessity for such surrender. 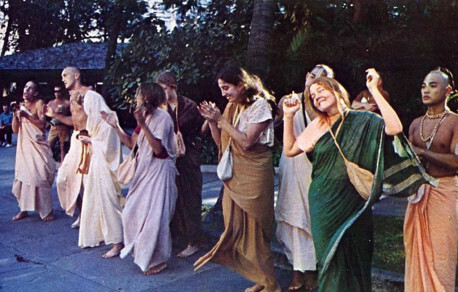 The more I accepted Srila Prabhupada’s words as absolute and the more I simply repeated his words—without adding or subtracting anything to my preaching—and the more I surrendered to him in my heart as my spiritual master, the more people joined our community. 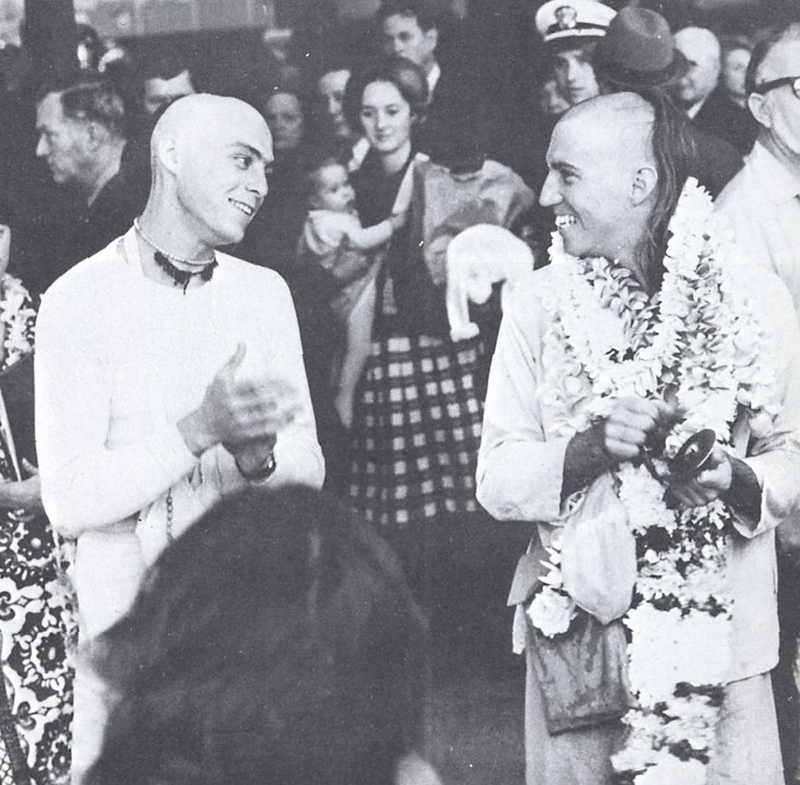 They were treating me as their spiritual master, yet in my heart I knew that Srila Prabhupada was really their spiritual master. Also at this time the Lord provided us with greater facilities to spread the holy names. 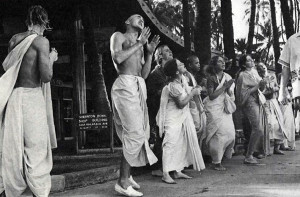 Both disciples and facilities came in proportion to the degree of surrender to Srila Prabhupada. While accepting disciples, it was now with full knowledge that I would be placing them, along with myself, at the lotus feet of Srila Prabhupada. In that sacred knowledge lay my only strength. Unfathomable is Krsna’s mercy—for He has sent Srila Prabhupada to distribute absolute knowledge to us. Unfathomable is Srila Prabhupada’s mercy—for he is freely distributing absolute knowledge of Krsna to everyone. The highest pleasure is in pleasing the Lord—so that is my desire. To please the Lord I must please the spiritual master; to please the spiritual master I must follow his instructions, knowing full well that they are the instructions of the Lord. I felt perfectly secure from this point on because no more speculation was needed in order to know how to please God. 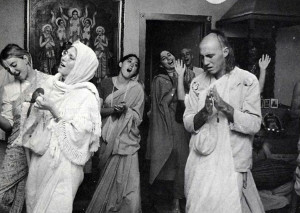 I knew from that point on that Krsna would be pleased simply by my pleasing Srila Prabhupada. Lord Caitanya’s attitude left a deep impression on me. I desired to be in the position of which He spoke: ”I am the servant of the servant of the servant—one hundred times the servant—of Krsna.” By my serving the servant of Krsna, the Lord would be pleased with me. 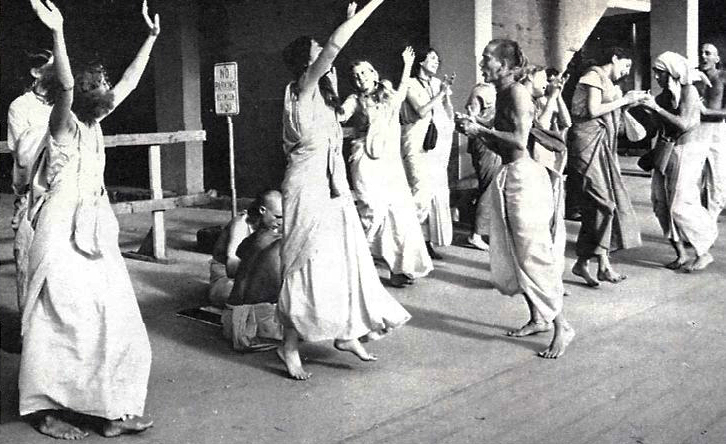 The Lord chooses those devotees who feel too impure to be with Krsna, and He hugs them as they futilely struggle to run from His arms. 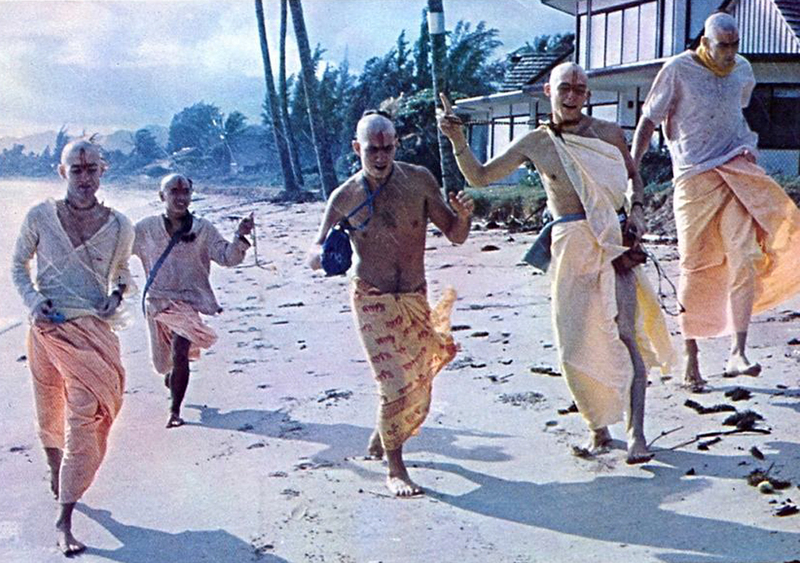 I knew that Srila Prabhupada would be pleased if I stopped my independent nonsense and entered into ISKCON temples and learned submissively the science of love of God from his disciples. And so the specific plan of action was begun. Because my followers were sincere and serious in their endeavor to serve and love God, there was little trouble in the change. 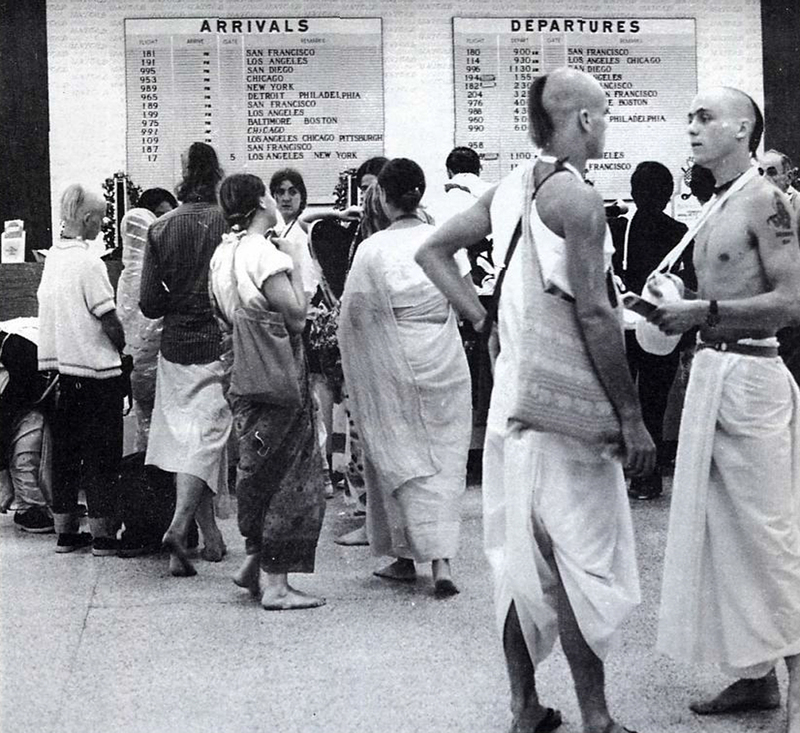 The only devotees who were confused were the few who had been trying to impress upon others that I was Krsna. 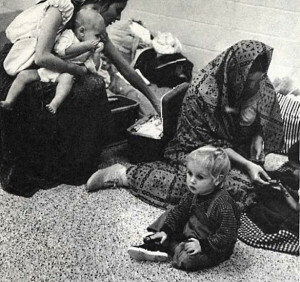 They were suffering from the same disease that Srila Prabhupada desires to free the world from: “I am God-ism.” No one left the movement, however, for out of Srila Prabhupada’s mercy they had already tasted the sweet nectar of devotional service. 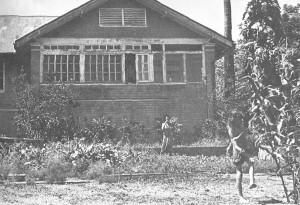 This can be seen by the fact that they had given up the carnival-like material life. They weren’t like the pseudo yogis who “meditate” a few minutes or hours a day and then go and engage in all sorts of nonsense. We had our fill of encounters with such “yogis” and “swamis.” In fact, recent encounters with a few Indian “swamis” on their way from India to the USA mainland (to get disciples) freed many devotees of their idealistic illusion about these cheaters in the garb of “Indian holy men” and simultaneously let me see that I was lending authority to these yogis’ independent rascaldom by my not surrendering to the bona fide representative of Krsna. A deep feeling of relief filled the air, a feeling that was free from any doubts of the correctness of my action. Safe in the hands of Srila Prabhupada, at the feet of the disciplic succession, a feeling of soul security prevailed. And added to this was the excitement at gaining so many new Godbrothers and sisters. 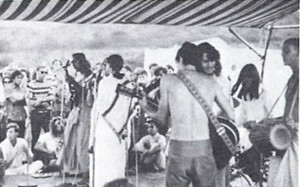 As one devotee joked, “Our community has not dissolved, it has expanded. 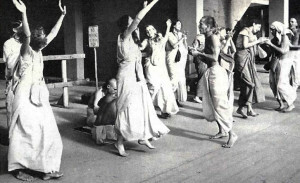 We now have temples and Godbrothers all over the world!” Spontaneous chanting and dancing began, and no one wanted to stop. 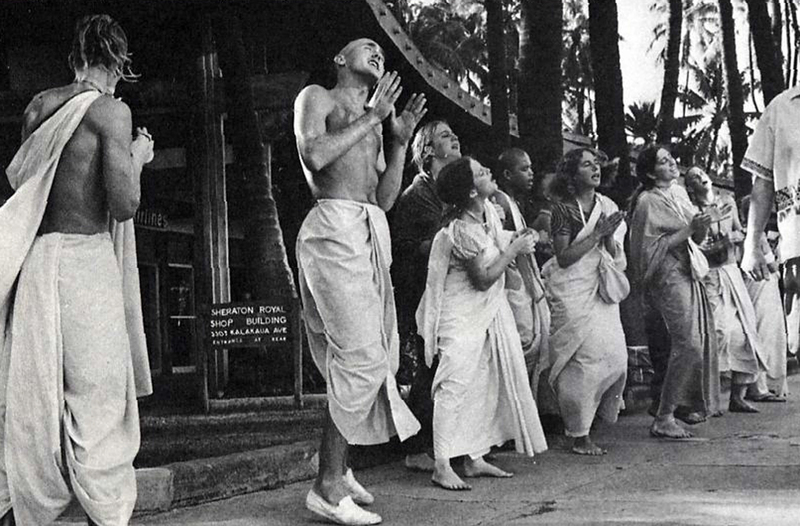 Shouts of, “All Glories to Srila Prabhupada! Gauranga! Hari Bol!” burst forth, opening a whole new chapter in our lives. All sectarian feelings had disappeared. Surely the Lord was very pleased! After prasadam and more chanting, the boys who wanted to follow my example began cutting their hair. 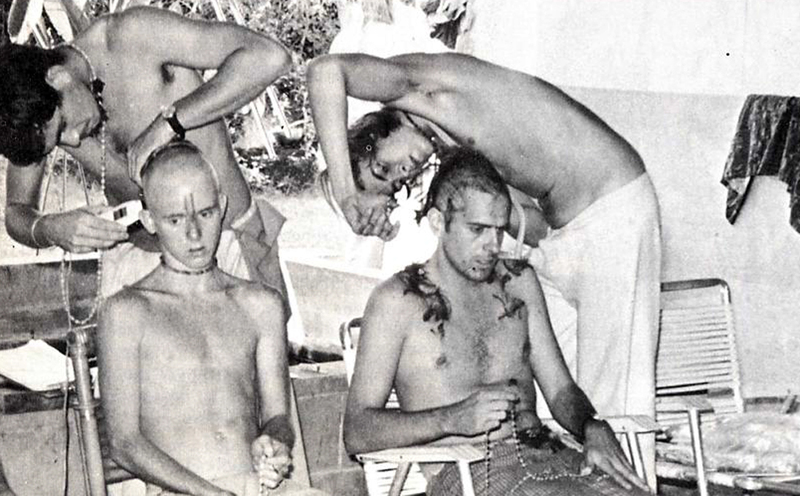 To us the hair cutting meant surrender to Srila Prabhupada and the disciplic succession. For the next two days, organizing for the exodus to the different ISKCON temples took place. 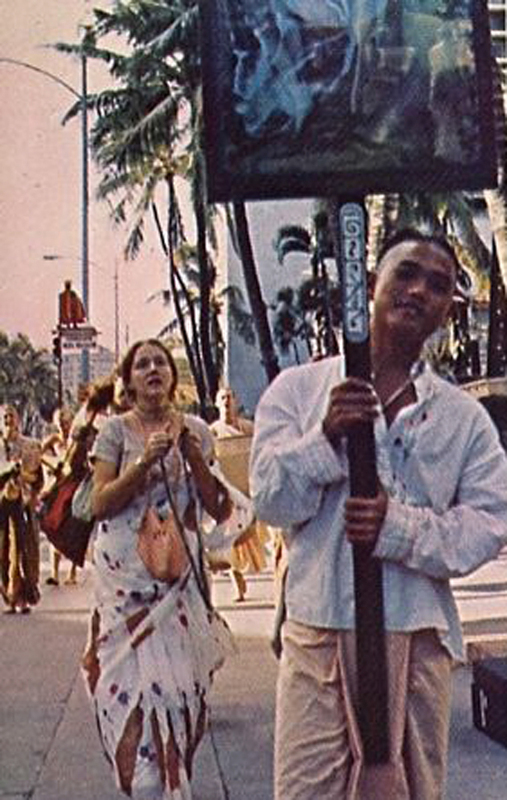 All our wealth was distributed to different temples, and our vehicles, property, etc., were handed over to Srila Prabhupada’s bona fide representative in Hawaii, Gaursundar dasa Adhikari. Nothing is or ever was mine. So I could not have given up anything at all. Materialists understand not the laws of the spiritual world; to move forward, one must move backwards. With each backstep, a step forward is gained. As water seeks always the lowest point, so should the devotee of the Lord. To move forward, then, is to surrender to the bona fide spiritual master. To be attached to serving and pleasing such a spiritual master is to be attached eternally to Krsna’s feet. There, securely stationed at the lowest point, in bliss, he is never attracted by the mundane “glory” or “pleasure” offered by the material circus world. I am certainly unworthy of giving anyone any advice, yet I would like to, at least, pass on to my innumerable brothers and sisters the wish of my most humble spiritual master, Srila Prabhupada. His wish is that you take to the chanting of Hare Krsna, regardless of your particular situation in life. 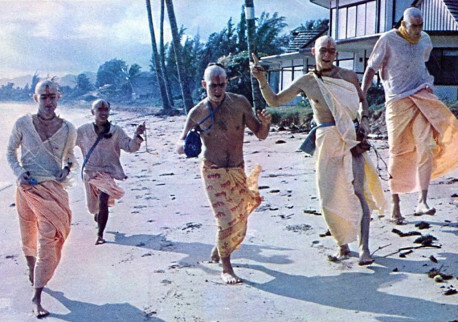 You are all much more qualified than I to bathe in the nectarean ocean of Lord Caitanya’s mercy; therefore you should not hesitate to chant, read Srila Prabhupada’s books, and visit or join any ISKCON Temple at any time. Hare Krsna, I heard about Siddha Swarup but did not know much about him so this article inspired me a lot. Where is he now? I would love to meet him. Chris Butler (the guy who wrote this) left ISKCON when the GBC issues started and has his own disciples again. Tulsi Gabbard is one of them.